Ten Years On: Live In London – Brand New Live Recording! October 29th, 2010 · Comments Off on Ten Years On: Live In London – Brand New Live Recording! And Nothing But The Bass Is 10 Years Old Today. 10 years ago today, I received a shipment of CDs from ICC duplication, to the Greenbelt Festival in Cheltenham – it was my first solo album, And Nothing But The Bass, and the start of my solo recording career. 10 years on, and I’m less than 24 hours into the life of a brand new album, Slow Food, with Trip Wamsley. It’s been such an amazing journey, not least of all because what seemed like such a weird thing to do back then – to me and to everyone else – is now so normal. The internet is awash with people experimenting with solo bass, and looping crops up everywhere from coffee-shops to the top of the charts. The gimmick potential diminished many years ago, for which I’m most grateful. It let me get on with making the music that mattered to me, via the method that made most sense. Solo bass was never a circus trick for me. I was never interested in looping as a way of showing how clever I could be. It was a way of me getting the music inside my head out to the world. I hear things in layers, I hear evolving texture not rock drums and last-chorus-key-changes. The template is still much the same. I’m just much better at it. The vision is more refined, the tech is better (thank the baby Jesus for Bob Amstadt and the Looperlative) and yes, I’m orders of magnitude more developed as a musician – technically, theoretically, conceptually, melodically… I just make better music happen. At least, I make music happen that is ever-closer to the soundtrack to the inside of my head. And I’m still loving it. I’m loving the collaborations this has all led me to – the albums with Jez Carr, Theo Travis, Lawson Dodds Wood, Mike Outram and now Trip Wamsley. The gigs with Lobelia, Michael Manring, BJ Cole, Cleveland Watkiss, Julie McKee… The myriad incredible musical moments of the Recycle Collective at Darbucka, The Vortex and Greenbelt. And I’m grateful to every journalist that’s ever taken the time to listen to and write about the music, every radio DJ that’s ever played it, and every person who has played a CD to their friends and said ‘check this out’, or emailed them a link, burned a CDR for them, emailed them some tracks. It’s all great, and I thank you for it. So, 10 years on, here’s the new album: Have a listen, enjoy, pay whatever you think its worth. For me, the last 10 years have been priceless. A Decade In Music – The Solo Bass Years. My first ever solo gig was at the Troubadour in Earls Court, London, on Dec 15th, 1999 – 10 years ago last week. The eve of the new millennium, and a gig that started with a lie (the lovely chap who booked the gig asked me if I had a whole set of material after seeing me do one solo tune in a band-gig. I lied and said ‘yes’ 🙂 ). It wasn’t the first time I’d played solo bass in public – that was a product demo at the National Music Show for Bassist Magazine in Nov 97. I also played weird improv noise stuff for a contemporary dance company in Nov 98. Steve Lawson has been one of the most inspiring and creative solo bassists to come out of the UK in recent years. His solo albums and collaborative projects have been the talk of the world-wide bass community and have drawn enthusiastic reviews in the press. His latest album ‘Grace And Gratitude’ finds him searching a theme in his own enigmatic way. I spoke to Steve recently and began by asking him about this album. press. What kind of response have you had from the fans? how do you set about creating a themed album of instrumental music? “That’s a really good question, and a tough one to answer! The prompting to explore the theme was that it was a continuation of the way I always write – trying to soundtrack whatever is going on in my head at that time – but discovering that my thoughts at that time were a little more focussed and coherent than when I’m usually making a record. The catalyst for that was the European elections here in the UK. I was insensed by the selfishness and ingratitude of so many on the political right-wing who were blaming people fleeing persecution and destitution in their own countries for coming to England to find something better, and attempting to use them as a scapegoat for all of society’s ills and to gain political ground against those who saw the issues in a more complex and grown up way. But instead of doing an angry record, I decided to channel that thought process into looking at the things that I’m most grateful for, and recognising that I haven’t earned any of them – they are all a gift, which is where the ‘grace’ part comes in. – What’s your favourite piece on ‘G&G’ and why? now get hold of that CD for themselves? “That CD was called ‘Lessons Learned From An Aged Feline Pt II’ – each time I do a CD, I release a second bonus CD for people who order the record in advance of the official release date. This works for two reasons – firstly as an insentive to people to order the CD early on, and thus helping me to recoup my costs quicker. But it’s also a way of me getting some of the enormous amount of music out there for people to hear. I tend to record hours and hours of music for each CD before I decide on which tracks to release. Some of it is pretty bad, so that gets scrapped, but for each CD, I end up with at least two albums worth of release-quality material, so this enables to get that out. another duets album and if so what’s in the pipeline? “At the moment I’m not certain what I’m going to do next. I do have a lot of duo material recorded with pedal steel guitarist, BJ Cole. BJ and I have been playing together for over a year now, and been experimenting with various approaches to combining out sounds. It’s not been an easy one, given that both of us are capable of making so much noise! But we’re beginning to find the right combination, so that might happen. “I’m also planning to try some gigs with Theo Travis, but with a drummer added to the mix. We’ve a couple of people in mind, and will be experimenting over the new couple of months. The tracks that we recorded on ‘For The Love Of Open Spaces’ have been evolving on the live gigs that we’ve done, and it’d be great to try taking them to another place with a drummer. “And work has also begun on Jez Carr’s debut all-solo album – so while I won’t be playing on that, I’ll be helping to produce that with him. Jez is an amazing musician, and looking forward to being able to follow up Conversations within the next couple of years too. “I’ve been gigging a lot over the last couple of years with Michael Manring, who is quite simply one of the most amazing musicians I’ve ever heard, let alone shared a stage with, and also one of my favourite people. We’ve made various attempts to record our duo gigs, but so far haven’t had much that’s been release quality, just in terms of the sounds. But we’re both keen to get something happening, so I’d guess that will happen at some point. We’ve even had offers from record labels wanting to fund it, but it’s something that we’re going to take our time with. For starters, Michael’s got a new solo album coming out in the next month or so, so will be promoting that over the next few months. “Desperation! I think that when you do music for a living, there’s a fine balance between seeing it as a job and getting tired of it, and feeling liberated by the absence of other things getting in the way. I cross that line fairly regularly. The main thing that keeps me focussed on how lucky I am is practising. I love playing, I love getting together with other musicians to try things out and I love doing gigs. Music is in and of itself inspiring, and not just in a notes and melodies sense. There’s something about being around creative people that makes you pursue creativity. “Beyond that, I find that most things will feed into my music – politics, relationships, faith, films, art, history, fantasy… Loads of things. “The current live set up for gigs in the UK is pretty involved – I now have two Lexicon MPX-G2 processors, two Gibson Echoplex Digital Pro + looping devices, a Mackie 1402 desk, and a Korg KP-II Kaoss Pad. It gives me so many great options and allows me to loop and process the musicians I’m working with as well! The move to a stereo set-up, and the switch to AccuGroove speaker cabinets has made my whole sound much clearer and less coloured. I’ve used the PA for voice, sax, piano and classical guitar as well, and it sounds better than any equivalent sized PA that I’ve ever used! – What are the plans for any live dates in the near future? You can check out all of Steve’s albums (and buy them!) at this website www.stevelawson.net, there are some free download tracks there and plenty of interviews and reviews to read. A new review…. of And Nothing But The Bass..?? May 11th, 2008 · Comments Off on A new review…. of And Nothing But The Bass..?? It’s amazing what you can find looking at your web-stats – I was browsing through mine, seeing who had linked back to this site, and found a review just posted on a blog in January of this year, of And Nothing But The Bass (my first album, for those of you a little late to the party). A little browsing round the blog in question – jamscience.blogspot.com – showed that it was a review that the writer, Ian Peel, had written for Record Collector magazine! “This music is apparently what Steve Lawson makes to entertain friends. Friends who make themself known as such simply by showing up to one of his intimate gigs in London. Or in Lincoln, Watford, France, California… or wherever Lawson and his little bundle of bass guitars, E-Bow sustainers and looping devices pitch camp for an evening of playing. And, having asserted your friendship by wandering in and sitting down, you can smile to yourself about the way his lush, demonstrative instrumental music manages to cross-reference Frippertronics, Pete Seeger, Jaco Pastorius and Joe Satriani (for starters) without them crashing into each other or crowding him off his own playing stool. You can also smile – with genuine enjoyment – at the sheer guilelessness of his music. The gauche jokiness of “And Nothing But The Bass”‘s title is accurate: Steve Lawson’s ‘And Nothing But The Bass’ with one exception, this really is all One Man And His Loops live in front of a small, polite but audibly happy audience. But it shouldn’t be dismissed as cutesy novelty, or as circus tricks with effects pedals: that isn’t the half of it. In London, we’re used to anxiety. Self-exposure from tortured musical artists, cool-by-numbers checklists, spotlight-grabbing attitude flexers; obvious-state-of-minders stapled to credible trends and sinking with them. Hearing Steve Lawson duck this, focussing quietly instead on the way music connects across generations and between person and person, is a sweet shock. On technical terms alone, Lawson holds his end up alongside American stars of the lyrical bass such as Victor Wooten or Michael Manring. But his work showcases not only prodigious playing talent but also a thorough lack of self-consciousness about engaging with his listeners. Maybe it’s from playing pop with the elfin, equally guileless Howard Jones; but when you hear Lawson duetting with himself on sprightly children’s-song tunes like “The Inner Game” and “The New Country” (wrapping joyously squishy melodies around his looped, nodding, double-stopped riffs) you know you’re not hearing someone who’s concerned about his agenda fitting anyone’s T-shirt. Or with the solemn rules at jazz school. All right, perhaps an over-mellow conflation of those lovable old chestnuts “Chopsticks” and “Blue Moon” (on “Blue Sticks”) is a step too far in this direction. All taste and no meat; too close to a musical life that’s one long function room. Lawson dispatches it with impeccable skill, which is all very nice but a little worrying. Far better to hear him feeding twanging threads of Celtic American folk song and bluegrass into “The Virtue Of The Small”, Flecktones-style; then splitting off to layer on luxuriously glutinous improvisations via serenely wandering fretless and classic metal distortion. Or to spot momentary nods to other bassists (Chris Squire, Steve Swallow, Alphonso Johnson, Stuart Hamm) who’ve let melodies rumble up from the basement. Or just to put the notebook down and enjoy tunes like “Bittersweet”, a fretless-bass-and-piano duet owing a little to both Pachelbel’s Canon and Weather Report’s “A Remark You Made”. Jez Carr’s strums of high, cautiously sweet piano haze this one lightly with blue. Perhaps it’s over-aligned with the fastidious, earnestly white, New Age end of jazz, but Lawson’s head-bowed cadences are beautifully poised – natural and regretful. So far, so immaculate, so “Bassist Magazine”. What really opens doors, though, are three pieces in which Lawson ventures into process music, chance-and-hazard and ambient music: closer to Fripp Soundscapes and post-rock than to John Patitucci. …and again… The moonlit ostinato foundations and skirling skybound melodies of “Drifting” give way to smears of trembling Frippertronical treble passes, like wheelmarks on cloud, and to trance-techno bubble echoes Lawson somehow wrings out of his bass. “Chance” clings on – just – to the right side of disassembly; the sharp attack or mother-beast rumble of Lawson’s fretless stepping in and around his frigidly emotional ECM bass figure, ghosted with minimal traceries. And the lapping sounds, heartbeat sub-aqua bass and shimmering harmonic nudges of the gorgeous “Pillow Mountain” are closer to Mouse On Mars than any bass guitarring this side of Rothko, as Lawson E-Bows strange Chinese string calls out of the beautiful murk. It’s with these pieces that we hear Steve Lawson’s audience returning a favour, moving away from bobbing their heads to the happy melodies and simply listening instead. And all without the man breaking much of a sweat, either. Anyone who’s been to one of Lawson’s recent concerts can testify that this CD’s a mere dry run compared to the music he’s now growing into. For any instrumentalist, this album would be charming; for Steve Lawson, it’s a showcase punched open at one end. His friends are watching him grow – I suggest that you join them. “The job of opening the concerts of the 21st Century Schizoid Band on their British tour was given to Steve Lawson and it proved to be an excellent coupling. 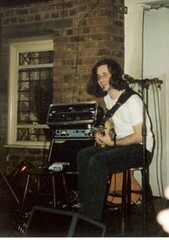 Lawson served as a rival attraction, with his innovative soundscaping for solo bass, to the older sounds of the former Crimson members, even though, in the course of the concert, Steve underlined the connection that linked his musical offerings with the music of King Crimson, making reference to Frippertronics. Steve Lawson opened his short set with No More Us And Them, a piece that will be included on his forthcoming new album, in which he immediately displayed his technique of layering loops created in real time, without any pre-recorded foundation. From the album And Nothing But the Bass he then performed the wonderful The Inner Game, followed by another new composition from his new album, entitled MMFSOG. Between the pieces, all played with a great mastery of various devices, pedals and e-bow, Steve entertained the audience with great charm. What a shame that his opening act lasted such a short time, less than half an hour. Highway One was followed by a short improvisation, after which Steve Lawson bade farewell to the audience with a beautiful version of the classic Fly Me To The Moon. “”Steve’s Debut CD is as the title states, a bass only record. All but one cut are live, but through the use of effects life looping and the E-Bow, Steve is able to paint sonic landscapes and them compliment them in real time. His melodic fretless playing is amazing, and realizing that it is all live is a testament to his impeccable intonations. And Nothing But The Bass was never intended for release but the overwhelming response to some sample tracks on his web site convinced him to go for it. “The Inner Game” reall showcases Steve’s improvised solo playingwhich is full of melodic hooks that go deeper and deeper as the song progresses. “Virtue Of The Small” rings like an acoustic guitar piece dropped a few octaves. When the distorted guitar comes in you would hardly guess that this luscious guitar tone is actually Steve and his fretless bass. [actually it’s a fretted bass! :o) – SL] His phraseing, the overtones, the harmonics all executed passionately and perfectly.